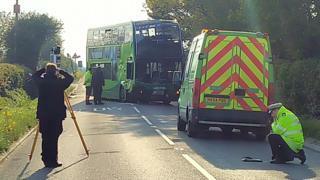 Image caption The crash on Forest Road, Newport involed two cars and a bus. St Mary's Hospital in Newport declared a major incident and called in extra staff to deal with the casualties. A spokeswoman for Isle of Wight NHS Trust said: "A major incident was declared at 13:51 today after a serious road traffic incident took place on Forest Road, Newport, involving two cars and a bus. In a statement, Hampshire Police added: "The driver of the bus, a man in his 50s, is also said to have sustained a serious injury. "Four people travelling in a silver Mini Cooper, were also taken to hospital as a precaution." St Mary's Hospital had asked people not to attend the emergency department but later stood down its major incident status. Hampshire Fire and Rescue Service, which deploys the island's fire appliances, sent five crews to the scene. A spokeswoman said: "We extricated three people from one car as well as the bus driver." Richard Tyldsley, general manager of Southern Vectis, which operates the bus, said: "At this stage the full circumstances of the incident are unclear, but sadly I understand one of the cars' occupants has died. "This is very distressing for all concerned and I would like to pass our sincere condolences to their family and friends. "The extent of any further injuries is currently unclear. We know several people have been taken to hospital and our driver had to be cut from his cab."